Once Christmas is out of the way, it’s time to ponder the new year – and buying a new calendar. 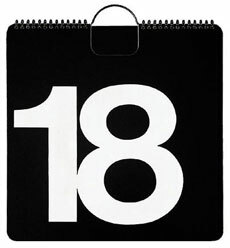 So why not invest in a calendar that will cover you every year – like the Max 365 calendar, designed by Massimo Vignelli and produced by Nava Milano. It’s pretty straightforward – a daily perpetual calendar, with each day just a flip away. But better than that, it’s an incredibly bold piece of design that jumps off a wall. It’s got a look reminiscent of the 60s – except it’s not. The plastic calendar was only introduced in 1980. Available to buy online, you can pick one up for £36.